What a wonderful collection of stories this turned out to be – sharp, pithy and uproariously witty. 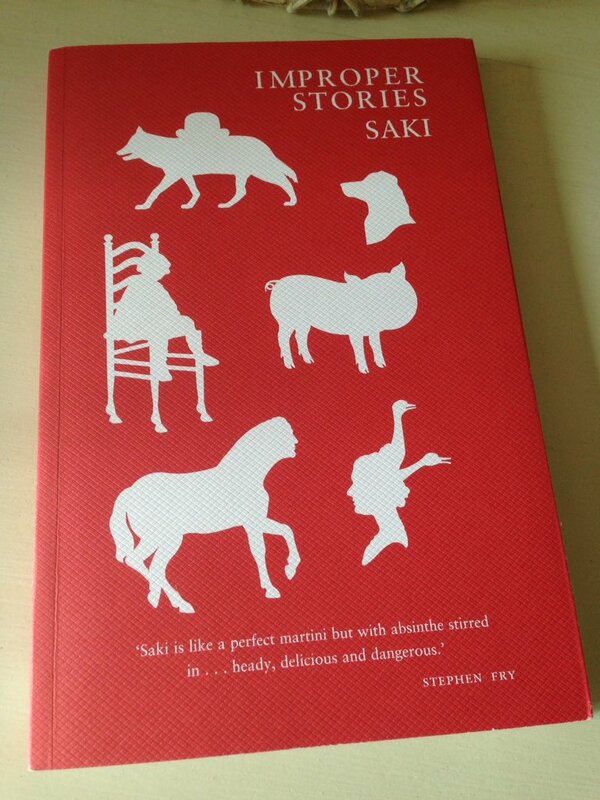 I first heard about Saki’s Improper Stories via Max’s excellent review from 2014 – you can read it here. Saki (or, to give him his full name, Hector Hugh Munro) began his career as a journalist and political satirist and then went on to write a number of short stories and sketches, a selection of which are included in this volume. Several of his pieces were concerned with the absurdities of Edwardian society, particularly the ludicrous social conventions of the English upper classes. Here are the surface niceties of lavish garden parties, formal dinners and hunting events, all of which fall under Saki’s satirical gaze. Improper Stories comprises eighteen stories first published in the years leading up to the start of the First World Word. As with other collections I’ve reviewed, I’m not going try to cover every story; my aims instead are to focus on a few favourites and to give a flavour of the volume as a whole. Several of Saki’s stories feature mischievous children rebelling against disagreeable, strait-laced guardians. In The Lumber Room, one of my favourites in the collection, Nicholas must stay behind while the rest of the children are treated to a day out at Jagborough sands. It is his punishment for an earlier misdemeanour at the breakfast table, one involving a frog and a basin of ‘wholesome bread-and-milk’. At an early stage in the story, Saki paints a revealing portrait of Nicholas’s rather draconian aunt, the woman in charge of the household – in reality, however, she is only the boy’s ‘aunt-by-assertion’. Convinced that young Nicholas will try to sneak off to the prized gooseberry garden while his cousins and brother are away on the trip, the aunt maintains a close watch on the entrances to the patch in an effort to spoil his fun. However, unbeknownst to the aunt, Nicholas has other plans for the day – he wishes to gain entry to the mysterious lumber room, a place normally kept under strict lock and key, only to be accessed by the more privileged members of the household. This is a very effective story in which the knowing child enjoys a moment of triumph over his authoritarian guardian. In a similar vein, although somewhat darker, is Sredni Vashtar in which a different boy, Conradin, takes his revenge on an aunt by way of his polecat ferret, the pet he has kept hidden in a secret hutch in the garden shed. This is a macabre little story, very much in the style of a classic fairy tale. Another cunning child plays a central role in Hyacinth, one of the sharpest stories in the collection. The story begins with a conversation between Hyacinth’s mother and her friend, Mrs Panstreppon. Hyacinth’s father is standing for election, and the boy’s mother is convinced that young Hyacinth would be an asset to the campaign. The trouble is, as Mrs P is just about to point out, while Hyacinth might look the part, he cannot necessarily be counted on to behave appropriately. I love the following quote which seems to capture something of Saki’s ridicule of the upper classes and the foolishness of their preoccupations. So, Hyacinth is allowed to attend the festivities, and at first he conducts himself impeccably, presenting the young Jutterlys with a gift of butterscotch. But then, while everyone else is busy watching the closing stages of the poll, the children disappear. It soon transpires that Hyacinth has locked the Jutterlys in a pigsty along with a litter of agitated piglets, much to the fury of the piglets’ mother who is now pacing up and down on the other side of the sty door. In effect, Hyacinth is holding the Jutterlys to ransom. If their father wins the election, he will open the door for the sow, allowing her to take wreak havoc on the children; but if his own father triumphs, he will be kind enough to lower a ladder into the sty, thereby enabling the Jutterlys to escape without harm. To discover how the end of the story plays out, you will have to read it for yourself. Other highlights featuring precious or knowing children include The Boar-Pig, the marvellous tale of a socially-conscious woman who tries to sneak into a garden party unnoticed when in fact she hasn’t actually been invited, and The Story-Teller in which a group of young children take delight in being treated to a dark story with a sting in its tail, much to the dismay of their disapproving guardian. The Boar-Pig is covered in detail in Max’s review, so I won’t elaborate on it any further here, save to say that it points to another of Saki’s recurring themes: mischievous or playful animals. Perhaps the best example of this can be seen in the final story of the collection, the fittingly titled Tobermory who turns out to be a most unusual cat. When the rather bland Cornelius Appin – a man with an apparent reputation for cleverness – is invited to Lady Blemley’s house party, he surprises the coterie of guests by announcing that he has been able to teach an animal to talk. The animal in question is, of course, the Blemleys’ cat, Tobermory. Unsurprisingly, everyone present is eager for a demonstration of Mr Appin’s skill, so Tobermory is rounded up and allowed to take centre stage. What follows is a hilarious sequence of revelations; not only does Tobermory speak as eloquently as anyone else at the party, but he also persists in telling the unfiltered truth, thereby revealing various secrets and private conversations much to the embarrassment of everyone present. Here is a brief extract from his pronouncements – Major Barfield is the first to speak. The moment he had said it everyone realised the blunder. This is a deliciously impish story with a rather poignant coda, not only for Mr Appin and his fanciful pursuits, but for poor Tobermory too. ‘Perhaps an eagle or a wild beast has carried him off,’ suggested Clovis. This is a typical Clovis rejoinder – sharp, satirical and wickedly acerbic. While the majority of these stories are witty and humorous, two or three are somewhat different in tone. Stories like The House of Fate, the rather poignant tale of a desolate wanderer who is mistaken for the master of a farm, a young man who disappeared some years earlier under a cloud of ill feeling; The Open Window, an eerie story which harks back to the tragic disappearance of a group of men precisely three years ago to the day; and The Music on the Hill, a rather macabre story which Max explores in his review. In many ways, they add variety to the collection, demonstrating Saki’s emotional range – he is a clearly writer with more than one string to his bow. All in all, this is a first-rate collection of stories, one I’m delighted to have discovered. Improper Stories is published by Daunt Books; personal copy. This entry was posted in Book Reviews, Saki and tagged Book Review, Classics Club, Daunt Books, Fiction, Hector Hugh Munro, Saki, Short Stories, UK on August 29, 2017 by JacquiWine.